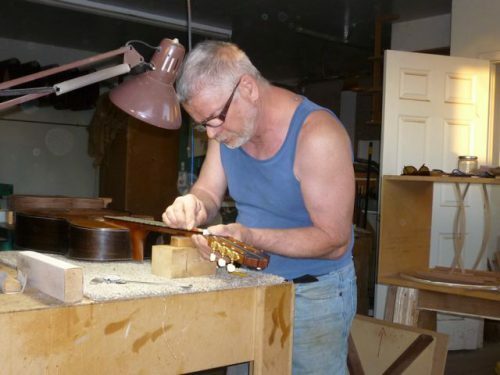 Benz Tschannen is a Swiss-born guitar maker living in Fallon, Nevada. I sent him a few questions after first meeting him at the Sierra Nevada Guitar Festival this past summer. CG.org: What was your path to luthiery? How old were you when you started building guitars, and how did you move your first steps? BT: Music was always a big part of my life, singing in school, at church, with the boy scouts, where I started playing guitar. From there I went on to take lessons from Miguel Rubio at the Conservatory of Bern. So after graduating from Gymnasium, instead of going to University like most everybody else, I attended Professional School at the Conservatory, graduating in 1973. From about 1970 to 1975 I taught Classical Guitar at various Music Schools and Teacher College in Switzerland. In 1976 I moved to Denver, where in 1978 my Ramirez was stolen. That was a big blow, and I started reading books about building instruments, while learning to become a cabinetmaker. About 1980 I started cutting pieces for 2 guitars, and alongside built a “Lute-thing”, a Lute body with long neck and a Sitar bridge, with gut strings. It turned out to be too impractical to play for several reasons, later underwent two rebuilds, and is now at my shop as some kind of 10-string, lute bodied instrument. The guitar parts moved with me to Fallon, NV in 1987, but did not get worked on until after I built a shop on my property in 2003. After that date, I started to spend more and more time building guitars. In 2005 I sold my share in a local cabinet shop and started building guitars full time. I was 56 at the time. 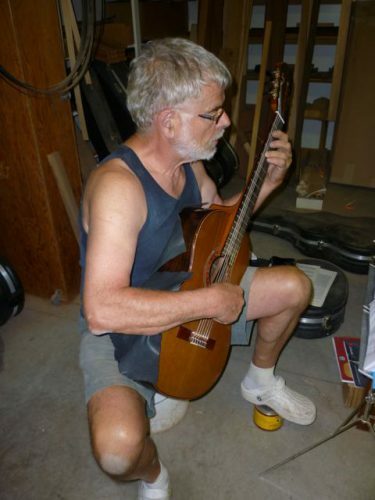 The first guitar I built after Arthur Overholtzer’s book, then went on to build after plans from the Guild of American Luthiers (www.luth.org), building a Cedar top and Spruce top in parallel, first after Ramirez plans, then after Romanillos plans. I was lucky that from the first guitar, they all sounded way better than anything I had played after the Ramirez. So that encouraged me to keep going, and I even started playing again, after a break of about 25 years. Over time I settled on a symmetrical bracing pattern, started to sell my guitars, first in Scottsdale, then also at GSP in S.F., later at Trilogy. Nr 14 was my first double top, a cutaway model after Lowden. Nr 18 was the second double top, still Spanish style; Nr 19 was another carbon top, this time with an elevated fretboard design. Nr 20 was the first model with most of the features I have kept since then: double top, elevated fretboard, truss rod, light radius on the frets, sound port. I have built two 8-string and one extended 7-string guitars with the same design features, and am currently finishing Nr 44 and 45. CG.org: Where do you see yourself on an imaginary continuum between tradition and innovation? What do you consider to be innovative or progressive elements in your design? BT: The main purpose of innovation should be to achieve any of the following: Easier playability, wider sound palette, (which includes volume, timbre, sustain, difference between “soft” and “sharp”), but also a more stable design weather-wise—i.e. less sensitivity to humidity changes—and, lastly, easier serviceability. To me, the double top serves all but the last: It gives more volume because it is lighter, it increases the sound palette, and, in combination with a built in dome, is more stable. A sound port gives the player direct feedback without having to rely on the acoustics of a given space. A light radius of the frets makes barres easier. The truss rod allows for fine tuning and stabilizing the neck relief and action. The elevated fingerboard helps indeed with reaching the high notes. Another feature I really like is the “wedge”, where the sides are not symmetrical, but narrower on the bass side of the guitar. It allows for a more relaxed right arm position, and, in combination with a shallower body at the heel, also for a more relaxed left arm. I have tried one “fanned fret” guitar, which I really liked, and want to try another with a slightly more pronounced fan. Another thing I would like to try is a “heelless” design, because I think it will help with serviceability, and also possibly with playability. All these design features have been used for some time by different builders; some might by now be considered part of “tradition”. I believe it is the combination of all of them into one guitar that makes my own unique. One has to keep searching, picking up ideas, trying things in order to keep abreast with the competition. CG.org: Describe your ideal guitar sound in so many words. BT: Clarity and evenness across its range, warmth, good sustain, but above all, a wide range of “registers”, controlled by right hand position and attack. CG.org: What’s your ideal client? Do you find that players can help you build a better guitar by telling you what they want, or perhaps do you tailor your building to match a client’s playing style and technique? BT: An ideal client has some idea of the parameters they like in a custom made guitar, i.e. scale length, action, string spacing, wood choice. But all of these can be worked out by asking leading questions in regards to a person’s playing style, hand size, etc. Wood choice can be refined by mailing pictures of a particular set. Sometimes it can take several clarifications to arrive at a point where I can actually start building. Players usually just tell me if they like my guitars, unless they have a special feature in mind. I would not have built an extended 7-string without being asked to do so, for example. CG.org: Do you have favorite woods or combination of woods? Are there some woods you just will not work with, and if so, what is the reason why? BT: There are many beautiful woods suited to build guitars. There are some to stay away from for legal reasons, such as Brazilian Rosewood and certain Ebonies. There are also woods that are not well suited because of their dampening qualities, Linden or Bass being some of them. BT: As long as I can get tropical hardwoods legally, I see no reason not to use them. Even though in some instances the definition of “legally harvested” is probably questionable, as there is corruption in governments of many developing nations, and revenue from the sale of these woods sometimes goes directly into the pockets of government officials—check out the Bruno Manser Fund (www.bmf.ch/en/) to see what I’m talking about. As for using domestic woods, I have not tried many, but given the realities of CITES Government regulations no doubt will, sooner or later. CG.org: Do you have any advice for players looking to buy a new instrument? BT: Trying out a new guitar, I would suggest taking as much time as possible at a specialized store with good selection. Go back more than once, keep an open mind and don’t necessarily go for names. Instead, try to explore each guitar’s full range by changing right hand position and attack position. Pay attention to feel if your left hand feels comfortable. Remember, you are making an investment, so take your time. Great interview Chris! I think it’s getting super important to be thinking about specific woods, especially Brazilian Rosewood these days – could make crossing borders a lot more complicated! Glad you like it, Rob, but Giacomo did the interview. Great interview. Nice to see their are still some luithers out there with great passion for the craft and who are still building great guitar.